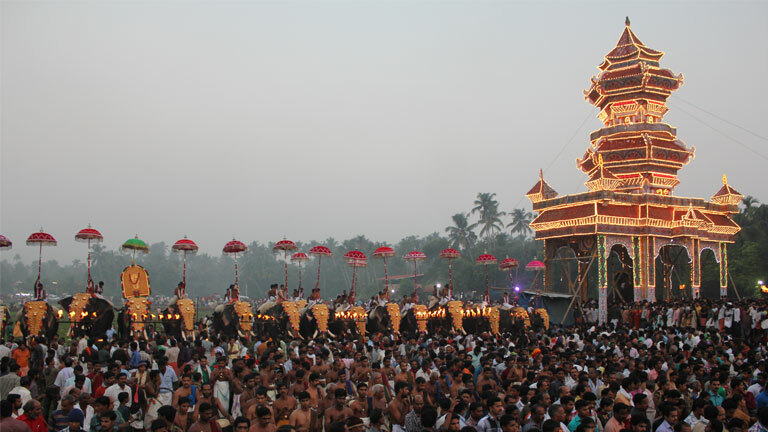 Considered as the mother of all pooram festivals in Kerala, Aarattupuzha Pooram is famous due to its sheer magnitude and grandeur. The Sree Sastha Temple at Arattupuzha, about 15 km from Thrissur is the venue of the festival. Held during the month of March, the eight-day long festival marks the visit of gods and goddesses from nearby temples to the Arattupuzha Sastha temple. The seventh day of the pooram witnesses the percussion ensemble of Sastha, which will also have caparisoned elephants and brightly lit traditional temple torches called thee vetti. Next day early morning is the grand spectacle, which will have 50 odd elephants carrying the replica of the deities of nearby temples, moving to the nearby field for the final assembly. The temple orchestra lends a majestic tenor to the extravaganza. Following this, the aarattu (ceremonial dip) in the nearby river is done for all the deities with the presiding deity of Arattupuzha Sastha temple taking it in the end.